Education is a journey, and some journeys are epic. For Jason Pappas, teaching faculty and director of undergraduate practicum in the Department of Sport Management, helping students enjoy epic experiences is just part of the job. 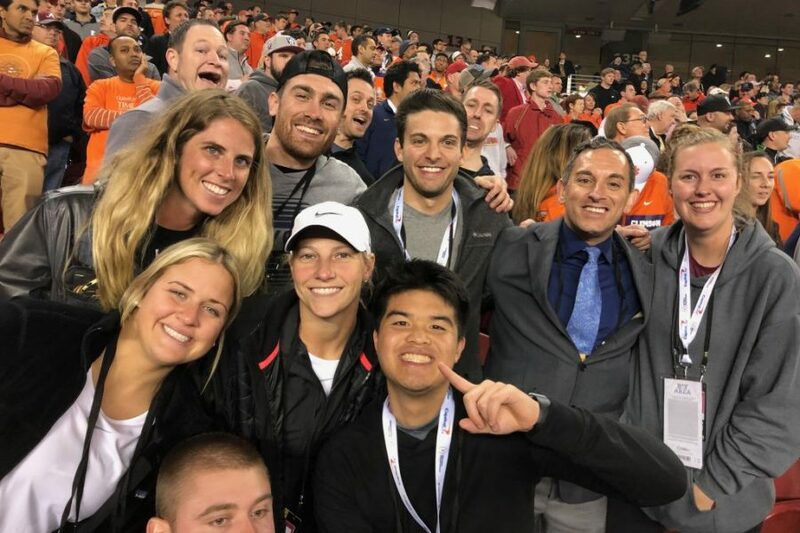 Recently, Pappas brought eight FSU Sport Management students to San Jose, California, for the College Football Playoff championship game Jan. 7 to get a truly epic educational experience. A major advantage that students in the FSU Sport Management program have is the extensive network of alumni and friends who work throughout the industry. Occasionally, students will get the opportunity to meet with these individuals and organizations through one-off talks and meetings or internships. There are also annual events such as the FSU Sport Management Conference, where students can meet potential employers, listen to industry talks and network with professionals. And then there are trips like the one that took place at the beginning of January. For students passionate about sport management, such trips present unique opportunities to get hands-on experience and work closely with professionals. “The opportunity for our students to learn and gain practical experience with one of the best event and entertainment management companies in the world while being a part of the second biggest sporting event in the country is invaluable,” Pappas said. FSU Sport Management students meet with Sacramento Kings’ representatives. The trip started out with a busy yet exciting schedule. 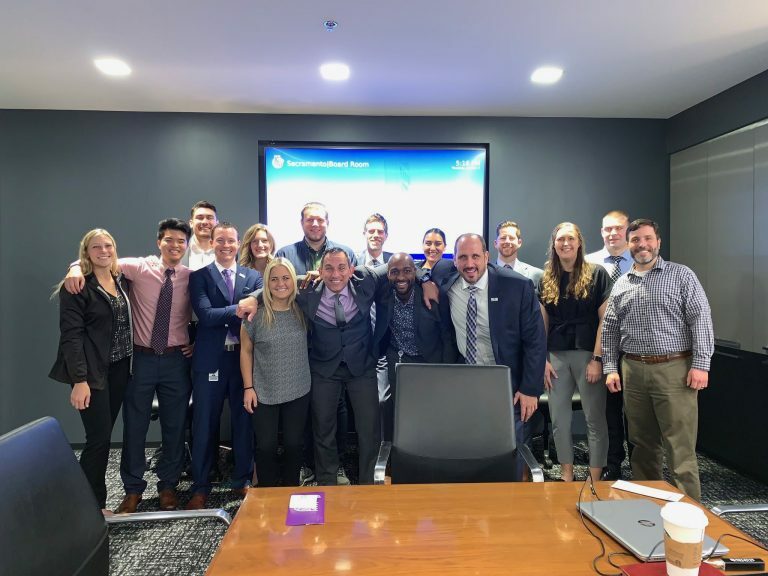 After landing in San Jose, the group of Sport Management students and Pappas made the long drive to Sacramento, where they enjoyed a panel discussion with employees of the Sacramento Kings organization. The NBA team also provided the students with lower-level tickets for the night’s game. On the second day of the trip, the group got some hands-on experience while working with the live event agency Etzel. As part of the work, students put up scrim (a material put on fences to make them more appealing), set up the tailgate area and more. During this time, students networked and asked questions. The whole process took two days to set up and take down after the College Football Playoffs concluded. 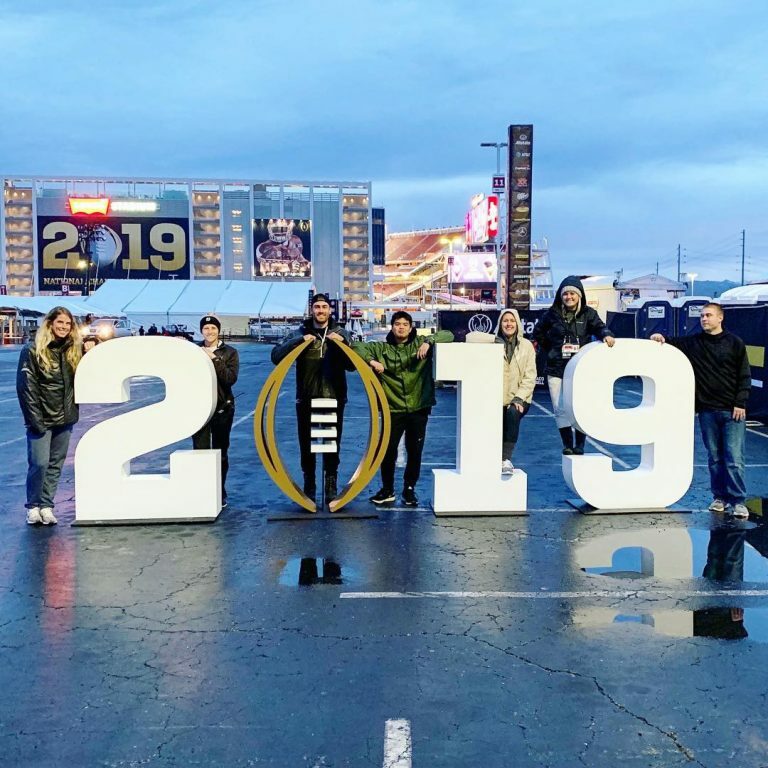 FSU sport management students prepare for the tailgating event at the 2019 national championship game. Due to weather conditions, the original plan for Sunday was cancelled, which meant the students worked extra hard to accomplish their responsibilities for the championship game. They set up tents, more scrim and prepared the tailgate area. During the morning of the game, the students divided into two teams and handled various responsibilities, such as hosting family and friends of Clemson and Alabama teams and preparing the stage for a performance by Keith Urban. The trip contained one more surprise: the Etzel Agency provided the students tickets to the championship game itself. Tired but excited, the students watched Clemson win the college football championship. For some of these students, it is the first of many events designed to give them real-world experience in the field of sport management. For the eight FSU students, the trip was more than just something to put on a résumé. Opportunities like working the College Football Playoffs don’t just build experience; they build memories that will last a lifetime. Learn more about the sport management program at Florida State.